Masha Galyamina from the village of Fedoskino created this originally shaped box. The work is called "An Old Forest Man". According to folk believes, the Forest Man is a forest spirit who keeps the forest and can understand the language of animals. 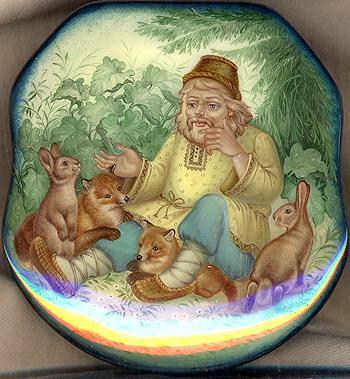 Here we can see the Forest Man telling something interesting to foxes and hares. The box's exterior is covered with deep green oils mixed with aluminum powder. Its interior is traditionally red. The box is made out of paper-mache. The lid is hinged from the top of the composition, and the box rests on legs. Signed with the name of the artist, the title, the village of Fedoskino, and the year of 2004 on the lid's interior in gold paints.